Before booking my cruise on the Disney Dream, I had heard about some of the excursions and activities, and toured the restaurants on the Disney Fantasy. But that didn’t really prepare me for the reality that when booking your cruise, you really do need to plan everything you’re going to do in advance. I was shocked to see how much was actually sold out when I started making my arrangements. As a first-time guest on Disney Cruise Lines you can start making your reservations 75 days in advance, unless you’ve booked a Concierge stateroom in categories 1 – 3, in which case you can start 120 days in advance. But who am I kidding, since I booked my entire trip 59 days in advance, that means I started right away! If you are interested in going on any shore excursions, eating in either of the adult-only restaurants on board, going to the spa or fitness center, doing on-board activities, or sending your child to the nursery, you will want to reserve these as far in advance as possible. First, typically you would choose your “seating” for dinner. Seatings are either around 6pm or 8pm. The earlier tends to fill up first, so my family was automatically assigned the second seating. I’m actually fine with that – my child is 12 and is looking forward to staying up late at the tween club. But I can see how that would be a real issue for families with small children. 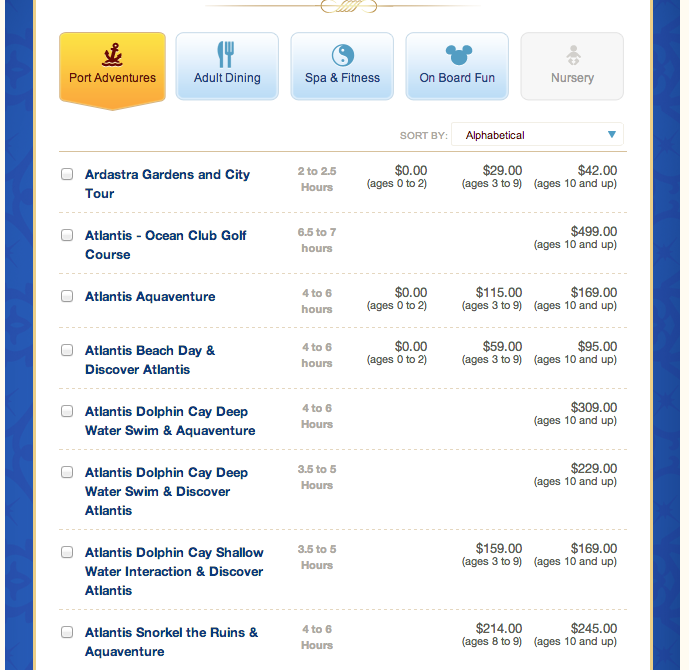 If you find yourself in this situation, you can avail yourself of a very cool thing that Disney does for younger kids. You can let your server know that your child would like to go to the Oceaneer’s Club after dinner. They’ll bring your child’s dinner very quickly, and then after a little while the Oceaneer’s counselors come to take the children up to the Club. They can play, while parents stay and have a more leisurely dinner. I know I would have LOVED that when my kiddo was young. 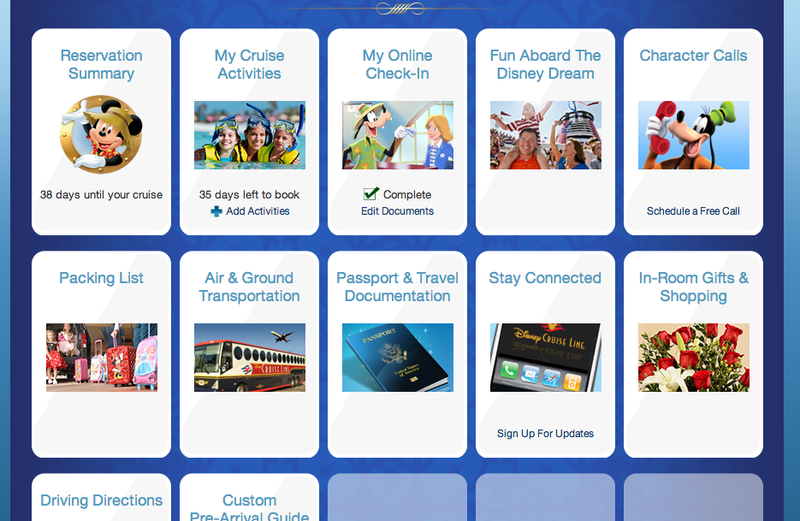 Shortly after you’ve booked your cruise you’ll receive a login for your personalized Planning Center on DisneyCruise.com. DO NOT LOSE THIS EMAIL! You’ll need this login. Jump right in to the Planning Center. 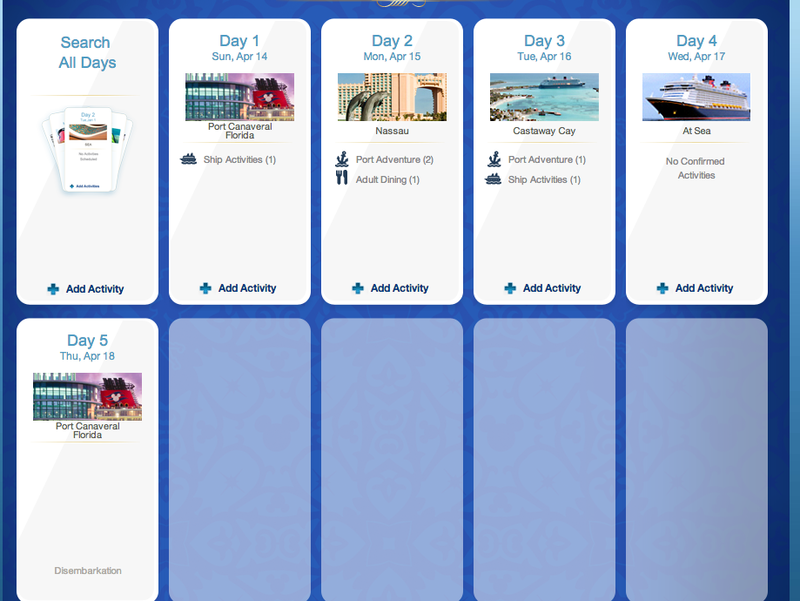 It’s really helpful in showing you what’s available on each day of your cruise. Click on My Cruise Activities. Here’s where you can see the excursions and activities available to you to book each day. Click Add Activity, and you’ll arrive at a screen that shows each day of your itinerary. When you click “Add Activities” on one of the days, you’ll receive a menu of available types of activities – Port Adventures, Adult Dining, Spa & Fitness, On Board Fun, and Nursery. Clicking on any of these will give you the list of options. For instance, here’s what it looks like for “Port Adventures” on our Nassau, Bahamas day. Choose the adventures that look fun and fit your budget, and reserve as soon as possible. Some do sell out. 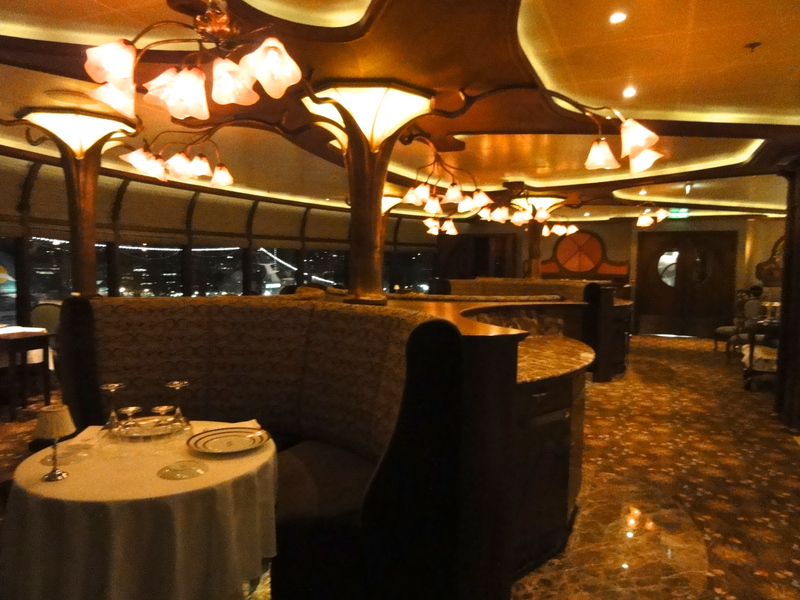 If you’re interested in some adult dining time while on your vacation, there are two adults-only restaurants on the Disney Dream – Palo which is Northern Italian, and Remy, which is French. You can go ahead and book these reservations within your Planning Center, just as you would using an online dining reservation service like Open Table. are required for men, but not ties. I’ve read on some websites that men wear tuxedos to Remy. Pretty sure I’m not talking my husband into that one. You can check out the menu here. I had a chance to visit Remy on the Disney Fantasy, and the room was gorgeous. I have no qualms spending money on food – it’s one of the highlights of vacation for me – so we booked a night at Remy. Spa and fitness services work much the same way. 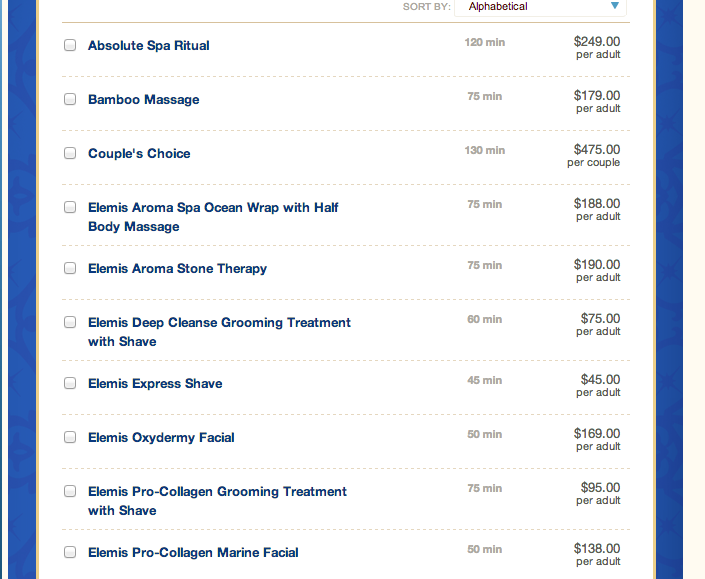 You can peruse the spa menu, and choose any services that look appealing. And what is in the “On Board Fun” section? Here you can book time for virtual reality Golf and Sports simulators. These were completely sold out by the time I booked my cruise. They’re limited, and apparently popular. Whew! Lots of thinking and planning online up front, and a little stress now, but presumably this will lead to everything being taken care of so that when you are on your vacation you don’t have to think. I’m really hoping that’s how it works, anyway! Wondering what we planned? In Nassau we’ll be going on a Blue Lagoon Island Dolphin Encounter, because it’s a long-held dream of mine to interact with dolphins and I never have done it. We’re eating one night at Remy, and we rented snorkels at Castaway Cay. Otherwise, my plan is to sit by a pool with a fruity drink in my hand. No reservations required. Next up – Travel Documents!